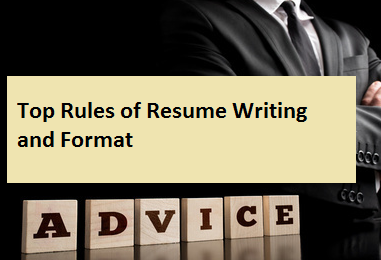 In this article 'top rules of resume writing and format', you'll get more information and details help with your career knowledge, feel free to copy or share. Fred Runyan didn't want to be left holding the bag when the Northern California-based management consulting firm he worked for completed a pending merger. After 10 years with the firm, the senior consultant knew there would be big staffing changes ahead, and decided to explore opportunities elsewhere. He needed a resume, though, so he shuffled through his desk to find the one he'd used to land his current job. He thought a few paragraphs about his decade-worth of consulting assignments would update it sufficiently, so he jotted them down. Next, he dug up a resume he'd received six years ago that had an attractive format. He handed the revisions and original copy to his secretary and asked her to make the finished version look like the sample. In an hour, his new resume was done and he felt ready to interview. Six months later, Mr. Runyan was still waiting for an invitation to interview. He'd received a few phone calls from employers, but nothing more. Discouraged and confused, he didn't know why the response to his mailings was so poor. He had worked for good companies, held responsible management positions and delivered strong results. Couldn't prospective employers see that when they reviewed his resume? Apparently not. By not thoughtfully redrafting his document, Mr. Runyan failed to address key issues of resume-writing, according to resume writers and career coaches nationwide. To ensure your resume makes the best possible impression, it's essential to meet six challenges regarding its presentation, format and content. These challenges and resume writers' advice on solving them follow. You'll need both a print and an electronic version of your resume. Each version has different visual issues. Your print resume is considered your primary marketing document and its appearance is critical. To survive next to those of hundreds of equally qualified candidates, it must look sharp and dynamic. Don't have it typed on an outdated word processor and printed onto plain bond paper, as Mr. Runyan did, and don't model it after resumes from years back, says Martin Yate, author of "Resumes That Knock 'Em Dead" (Adams Media Corp., 2000). "Your resume must be current in its style, format and tone," he says. Give your document an up-to-date style that attracts attention. This doesn't mean using an italic typeface, cute logos or an outrageous paper color. Instead, be conservatively distinctive. Choose a sharp-looking typeface such as Bookman, Soutane, Krone or Fritz, or, if your font selection is limited, the more prevalent Times Roman, Helvetica or Arial typefaces. Unless you're seeking a position as a graphic artist, don't put logos or artwork on your resume. However, using horizontal rules to separate sections can give it an upscale look, as shown on the accompanying document. Your choice of paper color isn't important, as long as it's conservative--white, ivory or light gray. However, a little creativity is permitted. For instance, consider using light gray paper with a white border or light ivory with a darker ivory border. This is a classy treatment that attracts favorable notice. Electronic resumes are "Plain Janes" that don't need boldface, underlining or other type enhancements. In fact, using such embellishments may make an e-resume harder to read once it's transmitted. If you need to emphasize a word, use capital letters to make it stand out, says Tracy Bumpus, executive director of RezAmaze.com Career and Resume Services in Austin, Texas. Also use a simple typestyle and lots of white space for readability. Format shouldn't be your primary consideration when preparing a resume. When Mr. Runyan saw a format he liked, he tried to manipulate his information to fit it. Other job hunters make the same mistake, says Don Orlando, owner of the McLean Group, a Montgomery, Ala., resume-writing firm. "You can't take an existing format and push your life into it," he says. "It simply won't work." Decide on a resume format after your text is prepared. Since each person's career history, achievements and academic credentials are unique, their resume format should be as well. Review other resumes for ideas, but craft your document to "sell" only you. When you start writing, concentrate on marketing yourself and don't worry about the format. It's likely that when you're finished, the format you should use will become obvious. You'll just need to change headings or margins, insert rules, bold or italic type or edit sections to fit your information more comfortably onto a page. Don't expect readers to struggle through 10- to 15-line paragraphs. Substitute two or three shorter paragraphs or use bullets to offset new sentences and sections. Don't overdo bold and italic type. Excessive use of either defeats the purpose of these enhancements. For example, if half the type on a page is bold, nothing will stand out. Use nothing smaller than 10-point type. If you want employers to review your resume, make sure they don't need a magnifying glass! Don't clutter your resume. Everything you've heard about "white space" is true. Let your document "breathe" so readers won't have to struggle through it. Use an excellent printer. Smudged, faint, heavy or otherwise poor quality print will discourage red-eyed readers. Type all your information starting on the left-hand side of the page. Don't center or justify any text. These formatting commands don't transmit well electronically. Length isn't as critical for electronic resumes as it is for electronic documents. Instead of typing your technical skills in paragraph form, cite them in a list. Also type your key words in a list instead of in column format. They will be easier to read. Typographical errors signal jobs-search death, which may be why Mr. Runyan's did so poorly. It contained three typographical and two syntax errors, as well as unpolished wording. He didn't recognize that resumes serve as your introduction to employers, and indicate the quality and caliber of work you'll produce. An imperfect document isn't acceptable. Write your document in the active first-person tense, never the third person, and choose language that's appropriate to the type of position you're seeking. If you're a mid-level manager, don't use "Ph.D." language. If you're in line for CEO, COO or other top operating slots, use words appropriate to that level. Proofread your resume not just once or twice, but repeatedly for typographical and wording errors. Then ask three to five others to review it, paying attention to your terminology and tone. Resumes aren't job descriptions. Still, you may have seen some that included such descriptions as, "This position was responsible for purchasing, logistics, materials management and distribution." Were you impressed with those? Mr. Runyan made this mistake. For instance, under "Experience," he included descriptions of positions without mentioning the size of his past employers or his achievements. It could have been anyone's resume. He also cited every job he'd held, going back to 1972. Listing all your past employment isn't necessary or helpful. And, if you list responsibilities, include their scope and your contributions. "Generalizations aren't impressive," says Shanna Kemp, owner of Kemp Career Services in Carrolltown, Texas. "A resume must include specifics -- numbers, percentages, details -- that communicate how well you performed in the workplace." Directed the planning, staffing, budgeting and operations of a four-site logistics and warehousing operation for this $650 million automotive products distributor. Scope of responsibility was diverse and included all purchasing, vendor management, materials handling, inventory control, distribution planning and field delivery operations. Managed a staff of 55 through six supervisors. Controlled a $6.5 million annual operating budget. Introduced continuous improvement and quality management programs throughout the organization. Results included a 25% increase in daily productivity and 64% increase in customer satisfaction. Spearheaded cost-reduction initiatives that reduced labor costs by 18%, overtime by 34% and material waste by 42%. Renegotiated key vendor contracts for a 28% reduction over previous-year costs. Prospective employers who read this description can sense the scope and results of the manager's experience. Remember, recruiters won't read between the lines for relevant information if you don't spell it out. And if positions you held 15, 20 or 30 years ago aren't relevant to your current career path, delete or briefly summarize them at the end. For example, "Previous professional employment includes several increasingly responsible management positions with the ABC Co. and XYZ Corp." Whether you include your dates of employment depends on your circumstances. A resume doesn't work if readers can't quickly grasp who a candidate is and what he or she seeks to do. For instance, it's likely that Mr. Runyan baffled readers with his objective: "Seeking a position where I can contribute to the growth of a corporation." "In my recruiting practice, if I receive a resume and can't immediately tell what the person does or what he wants, I'm finished with it," says Peter Newfield, president of Retail Search of America and Career Resumes in Golden Bridge, N.Y. "I just don't have the time." Strategy 1: Write a clear, well-defined objective. For example, you might say something like, "Seeking a challenging management position directing sales and marketing for a high-growth consumer products company." Dynamic 15-year career leading sales, marketing and service organizations throughout the U. S., Europe and Pacific Rim. Delivered strong and sustainable revenue gains in both emerging and mature business markets. Strong sales training and team leadership skills. Excellent qualifications in the information technology and telecommunications industries. A summary eliminates the need for an objective because it usually indicates the type of position a candidate seeks. Don't assume that stating your objective in a cover letter is sufficient. Cover letters and resumes must be able to stand alone. A resume should be more than a list of past jobs. It should serve as a personal sales and marketing tool that attracts and impresses employers. Your qualifications, words, format and presentation must all be packaged to sell yourself. "Sell the strengths and benefits you bring to the table," says Louise Kursmark, owner of Best Impression Career Services Inc. in Cincinnati. "Your resume is your one opportunity to get noticed. Unless you focus on those great things you've done, an employer will never know." Managed sales regions throughout the U.S. with 82 sales associates. Met all company sales goals and profit objectives. Independently planned and directed a team of 82 sales associates marketing sophisticated technology products throughout the northeastern U.S. Launched a series of customer-driven marketing programs to expand market penetration and increase key account base. Closed 2000 at 182% of revenue goal and 143% of profit objective. Managed all financial, accounting, budgeting, MIS and administrative functions. Chief Financial Officer with full responsibility for the strategic planning, development and leadership of the entire corporate finance organization for this $280 million consumer products manufacturer. Directed financial planning and analysis, accounting, tax, treasury, budgeting, MlS and administrative functions through a 12-person management team. Launched the introduction of PC-based client server technology to expand MIS operations throughout the finance function. Resulted in a measurable improvement in data accuracy and long-range business planning. To create impressive descriptions, ask yourself not only what you did but how well you did it. Then sell your achievements, not your responsibilities. When Mr. Runyan went back to the drawing board, preparing his resume took three weeks instead of an hour. The process involved his secretary, two friends and three professional colleagues. His new document includes a strong, accomplishments-oriented text and makes a sharp visual presentation. Two weeks and 100 resumes later, his phone started to ring. In one day, he had spoken with five employers and scheduled more than 10 interviews. By remembering these six rules, your resume can help you to do the same.